Click here to leave your feedback about the film "A Long Run"
If you can't make it to the theater you can watch it online from anywhere in the world on Vimeo. Click on photo or link to watch movie. 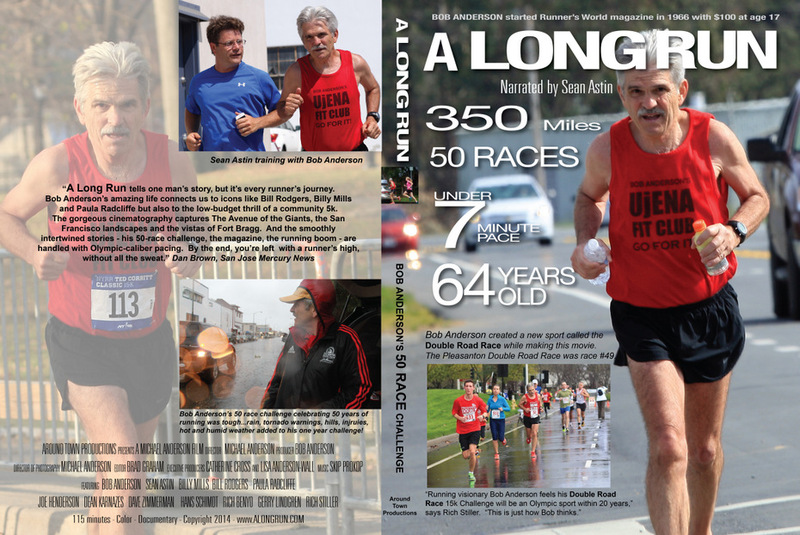 A Long Run the movie video (DVD) is now available. Additional Dates and Locations: Click below to buy tickets. 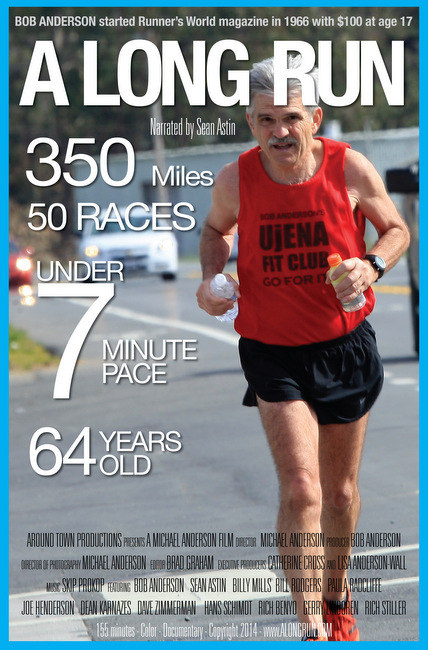 47 years later he started his 50 race challenge...one year - 50 races - 350 miles. His goal - Run under a 7 min/mile average pace at 64-years-old (which is equal to 5:30/mile average pace for a 30-year-old male or 6:00/mile average pace for a 30-year-old female). That's fast for any age! Did he reach his goal? How did he coop with injuries? Weather? Hills? How did he recover each week? Help us fight childhoood obesity...support youth running! *The Double Road Race Federation was created by running visionary and Runner's World magazine founder Bob Anderson. He created this new sport during his 50 race challenge. This new sport and new challenge with its strategic endurance twist is unique to the running world. It's a 15k challenge run in two legs. It's a 10k followed by a 5k with a Halftime break in the middle featuring the Recovery Zone. It's the only running event with a halftime. "A Long Run" is a full-length (1:55) documentary movie. This film took two years to shoot and edit. The official release date is April 6, 2014. 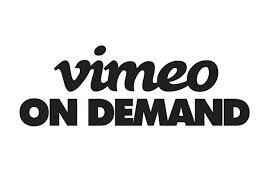 It is being shown at the Osio Theater in Monterey, California and world-wide on Vimeo. 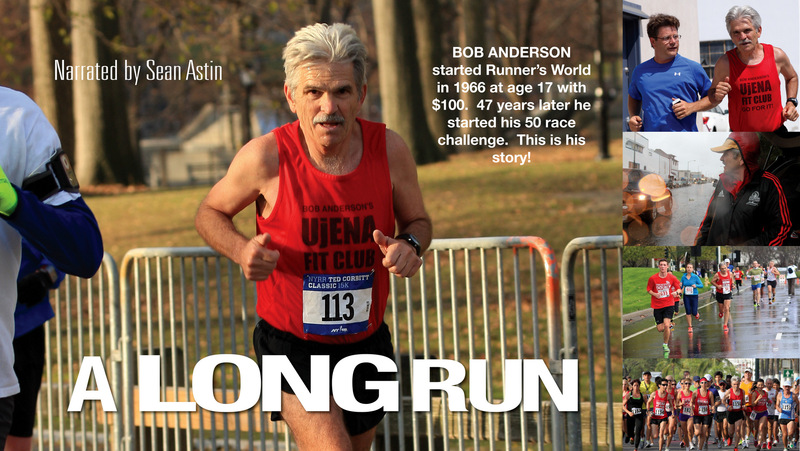 The story follows Bob Anderson, founder of Runner's World, as he celebrates 50 years of running by racing 50 races in 2012. His goal was to average under 7 minutes per mile for at least 350 miles. "The challenge itself is not that amazing. However, to race 5k to the half marathon each weekend at an average pace of under 7 minutes per mile makes it more of a challenge. Equally challening is that 64-year-old Bob Anderson works full time as the CEO and chief photographer of the Ujena Swimwear Company he founded in 1984," says director Michael Anderson. min/mile pace. This is like someone 30 years old averaging a 5:25 min/mile pace. Bob Anderson started running in February, 1962 and ran his first race in May, 1962. Within a year he ran a 2:08.5 half mile. At age 17 Bob started Runner's World magazine and published it for 18 years. He and his team had built the circulation to 435,000 before selling it to Rodale Press in 1984. With just $100 he earned from babysitting and mowing lawns he built a $25 million dollar company without borrowing any money or having outside investors. While publishing Runner's World he did not run as much as he wanted to. His over 300 employees took up a lot of his time and he mostly ran on weekends. He had started his magazine because he loved running and his magazine really help spring the running boom. He was able to concentate on his own running after the sale. At age 53 he ran the Cal Ten in 59:17 and more recently at age 61 he ran 1:26:26 for the half marathon. He has published over 50 books about running. 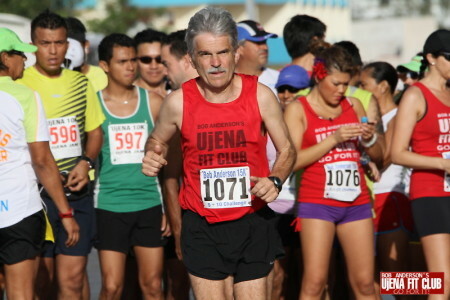 He started the UjENA FIT Club in August, 2011 and added Best Road Races in December of that year. He feels both are going to help inspire and inform a lot of people about running and fitness. "We have already faced some tough challenges in the first weeks of my 50 race challenge. Two weeks before the start, I tripped on a run and it took over 100 stitches by a plastic surgeon to sew me up. The scar above my right eye will never let me forget that moment," says Bob Anderson. "But actually from a running stand point my beat up knee caused the most problems. I could not totally bend it fully for weeks." "Bob's first race of fifty was New Years Day just two weeks after the fall. He could not hardly bend his leg but he knew that he needed to complete race number one. A 5k race put on by the DSE Club in San Francisco. I have never seen Bob start out so slowly. He was dragging his leg," says Catherine Cross, Bob's wife and co-producer of the movie. (Left) Adding to the challenge is that Bob works full time as the CEO of the Ujena swimwear company. He is also Ujena's chief photographer. Before racing the Bob Anderson 15k Challenge March 3rd, he had taken over 27,000 images of Ujena swimwear over five days. Photo by Steve Manente for Ujena Fit Club. The focus of the film is on Bob and his journey but it is also about runners he knows or met along the way. "Our goal is to make a running film that will inspire you to get out the door. Inspire you to be a better runner. Inspire you to get others out on the road. If you start lacing up your running shoes after watching our film, then we produced the film we wanted," says director Michael Anderson, Bob's son and runner. "I know my dad can pull this off. When he puts his mind to something he makes it works. Running has always been something our family does. I started running at the weekly Fun Runs my dad started in 1972. I have seen photos of me in my father's arms as he was giving out certificates to finishers. He has so many stories to tell. He knows so much about running. I am excied to be part of a A Long Run," says daughter Lisa Anderson-Wall. "I only started running a few years ago. I damaged my knee playing professional soccer and I thought I could not run. But how could I be married to Lisa and be the father of Bob's grandkids and not be a runner. I gave it a try and could not run a mile at first. But I stayed with it and it worked. I not only love running but also racing. I have already run two half marathons, my best being 1:27. Bob knows so much about running and I am looking forward in being a part of A Long Run," says son-in-law Justin Wall. Filming started December 28, 2011 on Bob's 64th birthday run with his family in San Francisco. "What better way to celebrate your 64th birthday by running with your family. That's what we did...bum knee and all. It was a beautiful morning to run along the SF Bay," says Bob Anderson. Filming continued at all of the 50 races during 2012 plus additional footage was shot during the week. Many runners along the way will be included in this film. Some of the people featured in the film include Bill Rodgers, Paula Radcliffe, Joe Henderson, Rich Benyo, Geroge Hirsch, Gerry Lindgren, Billy Mills, Christine Kennedy, Jose Pina and family, Sean Astin, Roger Wright, John Young, Katie McGuire, Hans Schmid, and many more. "A Long Run" is an Around Town Productions film with funding from the Ujena company. Sign up for email updates about the progress of "A Long Run"